Having a stable career is the key to happiness and a balanced life. After passing your secondary schooling, your primary focus becomes what should you choose for your graduation to make a successful career. Sometimes you do not get the right guidance and counseling, and you tend to choose the wrong career choices for yourself. Ans. SEO is a process to improve the ranking of website, blog, article, document, audio, video etc, in SERP (Search Engine Result Page. Q.2. Explain types of SEO? Q. 3. Explain the Phases of SEO? Nowadays, chatbots use artificial intelligence (AI) to redefine the way brands communicate with target clients. They boost sales, traffic as well as deal accurate as well as quick customer assistance and service. 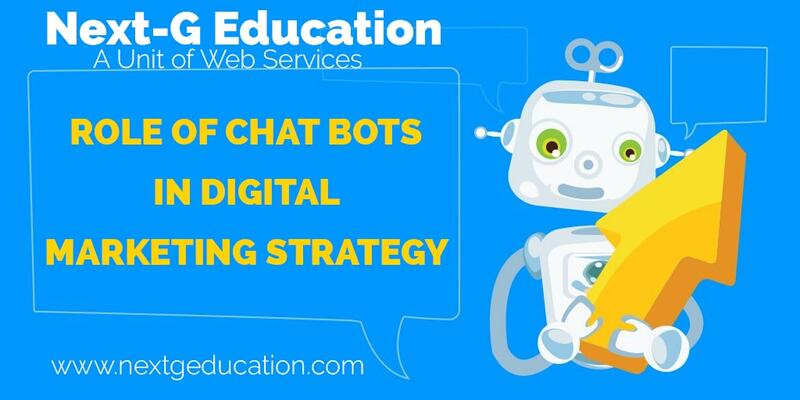 With the intro of AI, chatbots have become even more power to drive conversion in digital marketing. Why Should You Become A Web Designer? Different colors can provoke several associations, emotions, and responses which influence how the brand name is seen to the world. Simply speaking, your choice of colors can be a big deciding element of whether the design will function or not. According to the research, color can improve interaction, memory, as well as brand name visibility by around 80%. If you are the beginner and looking to enter in the field of web designing and web development, the biggest part of starting is to decide where to start. Now a day’s lots of programming languages are available, each with own pros and cons. But the good news is that if you are fresher, your journey starts with a web designer. Next-G Education has over 100+ high-quality courses available in both online as well as classroom mode across all over the country. All courses are a unique one and have been prepared by Industry Expert Professional. All the courses give students an interactive and enriched learning experience. Join Next-G Education today and start taking advantage of membership benefits and better opportunities straight away! Once you have registered for any course, you will get the opportunity to be a member of Next-G team. - Understanding of User-Centered Design Process. We are looking for hardworking candidates for our company Trendy Pvt Ltd., which is running for the past 3 years. The candidates must be graduated and have experience of 1 year in the field of Drupal and also as a set candidate. 1) Interview timing will be on Monday and from 11a.m.to1p.m. Are you creative one on paper? Or Are you the creative artist on par? Now it's a time to transfer your skill in digital platforms. Join us to transform your creative thoughts and ideas in the real world using the most popular applications in this field. Rules and put your artistic idea in our short term and diploma courses and improve your career in the area of Graphic Design. Next-G Education a Unit of Web Services is an ISO 9001: 2015, leading web design and Development Training Institute in India. We offer latest updated web design and web development courses for you to help you in connecting with the latest technologies. Learning graphics applications online can be a better option for careers in Graphic Industry, Print Media Industry as well as Web Design Industry. In today's digital India fashion, the role of graphic designers is precious. As we all know designs of products or services are the first impression where customer stay. If you are looking to start your career in web development, then you must sure about that institute which you are going to Join. If we discuss web designing & development training institute in India then we will get over one Lakh institutes. It's very difficult to select best one form them. 1. Know what you are looking? What is Web Design and Process of Website Design? Web Design a process to present the content and information on the internet or online for any type of business in the form of a website. Now if we discuss website then we can say that it's a nothing, just a collection of web pages. So as web designers our complete work is designing a web page. With the growing era of digitalization, the need for industry ready students is also rising in the IT sector. Various MNCs and giant companies look for those candidates who possess good practical skills and have hands-on experience in the industry. Web development has been one of the most demanding and successful professions in today’s time. It has a vast scope in the future and promises an astounding career for creative learners. Now the question that pops up into the mind is - what exactly web development includes?